Former Governor Linda Lingle is an experienced leader who has proved under fire that she can articulate a clear vision of where she wants to take an organization, how to get there, and convince others to join her. Whether being elected the youngest Mayor of Maui at age 37, the first Republican Governor of Hawaii in 40 years, or winning reelection with the largest margin of victory in state history, Governor Lingle has shown she can beat the odds. As a current member of the United States Energy Security Council, Governor Lingle has a fresh approach to solving America’s oil predicament. As a former two-term Mayor of Maui and two-term Governor of Hawaii, she has served as an effective leader who has vast experience on many critical issues. She delivers inspiring “nuts-and-bolts” strategies about energy, the economy, education, women & politics, overcoming adversity, and immigration. She will leave your audience wondering why they haven’t heard more about former Governor Lingle before now. As a member of the United States Energy Security Council, Governor Lingle is committed to a fresh approach to solving America’s oil predicament. She discusses how opening the fuel market to competition by making sure new vehicles sold in the U.S. are flex fuel, so that non-petroleum fuels can compete against oil in a free market, is the only way to destroy the OPEC oil cartel's stranglehold on the world. She also explains the positive impacts of fuel choice and competition on national security and the economy, and why reducing oil demand through fuel economy alone without creating competitive markets will fail to diminish OPEC's power. Today’s schools are doing too much indoctrinating and not enough educating. Teachers’ historical role of providing information has been usurped to a large degree by students’ access to the Internet. This changing role means teachers today are spending more time teaching a belief system than how to synthesize unlimited information, how to analytically approach an issue and how to question “common wisdom.” All of society is harmed when students are taught what to think instead of how to think critically. Parents need to make sure it is their values their children are growing up with, not their teachers’ values. There would be many more women in public office if they only knew how well suited they are for politics. Hawaii’s only woman governor since statehood explains her thoughts on why politics is such a great profession for women. She shares her personal story that answers the question, “How did a Jewish ‘girl’ from Missouri become the Governor of Hawaii?” Through her personal story of a fledgling journalist being elected councilwoman from the Island of Molokai, the first woman mayor of Maui, and Governor of Hawaii, it becomes clear that women and politics are a natural combination. Challenges can bring you down in life, or lift you up. Which direction you move is up to you. Gov. 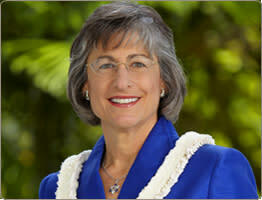 Lingle overcame a challenging childhood as her mother struggled with bipolar disorder at a time when there was little knowledge of the disease, but she turned her challenges into strengths by becoming the first woman Governor of Hawaii and the only Mayor of Maui not born on the island. Everyone faces challenges in life, and Gov. Lingle will share strategies for how to turn challenges into strengths. A critical issue facing our Nation is immigration. Gov. Lingle, as former Governor of Hawaii, became intricately involved with immigration policy. She discusses with audiences the importance of developing a comprehensive legal immigration policy and what such a policy would mean for the economy. She also discusses the need to revamp America's policies regarding tourist and student visas.